The heads of the 27 EU member states have called for ‘rapid progress’ on plans to stop companies abusing international structures. 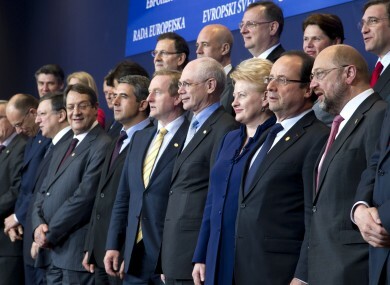 Enda Kenny and other EU leaders pose for a photo ahead of their European Council meeting in Brussels today. THE HEADS of the 27 European Union member states have asked the European Commission to come up with a plan to address the concerns over “aggressive tax planning” by major multinational corporations. The agreement between political leaders in Brussels comes only a day after Ireland came under international scrutiny for the tax arrangements exploited by companies like Apple and Google. Leaders called on the European Commission, led by Jose Manuel Barroso, to formulate recommendations on how “aggressive tax planning” and “profit shifting” could be dealt with. The Commission now plans to present a revised version of the ‘Parent/Subsidiary Directive’, a rule introduced in 2003 which abolished withholding tax on payments between related companies in multiple countries. Tax-free payments between related companies in different EU member states is a key part of the ‘Dutch sandwich’ taxation system used by companies like Google. In that system, an Irish company collects revenue for sales around the world, transfers it tax-free to a company in another EU state (usually the Netherlands), and then transfers it back to an Irish-registered company which is actually based in a low-tax jurisdiction like Bermuda. The Commission said it would also review the current EU laws relating to abuse of the taxation system. Today’s summit – one of the briefest European Council meetings in modern times – had been due to discuss tax evasion for several weeks, but the meeting took on an extra significance after a United States Senate committee asked Apple executives to give evidence about the country’s use of Ireland as a “tax haven”. Asked how this latest drive against tax fraud and tax avoidance would make progress when others had failed, European Council president Herman van Rompuy said the economic crisis now meant there was an imperative on countries to ensure they were not losing income. “What is different? The economic crisis makes the difference,” he said. European Commission president Jose Manuel Barroso called on members of the public to maintain pressure on their political leaders so that the agreements reached today were followed through. Explainer: How do Irish companies legally avoid paying billions in corporate tax? Email “Leaders back EU’s plan to attack ‘tax planning’ by the end of 2013”. Feedback on “Leaders back EU’s plan to attack ‘tax planning’ by the end of 2013”.